This one bedroom apartment is located on Rose Street, which runs between Princes Street and George Street and can therefore boast a superb position in the very centre of Scotland's capital. The apartment is on the first floor of a traditional building that was built around 1790. It is rated 3 stars by the Scottish Tourist Board and can accommodate 2 people very comfortably although this can be increased to accommodate 4 people by using the sofa-bed in the living room. The lovely sitting room has a 26 inch, wall-mounted, LCD TV which has multiple digital channels. There is a DVD player and hi-fi system (with DAB radio channels). This room also benefits from a remote controlled living-flame gas fire. The fully fitted, eat-in kitchen has quality appliances and includes a dishwasher and washer/dryer. The shower room has a mains power shower and the double bedroom has a large fitted wardrobe. Wifi internet access is provided. Property had everything you need a d was very comfortable. Would recommend this property. Have been several times and will be back. What a gem! Great bars and restaurants at your doorstep. Short walk up the hill to the castle and the Royal Mile. Short walk to the train station and meeting place for excursions. The apartment was much larger than I had expected with a washer/dryer, living room and bedroom with a wardrobe to hang clothes. 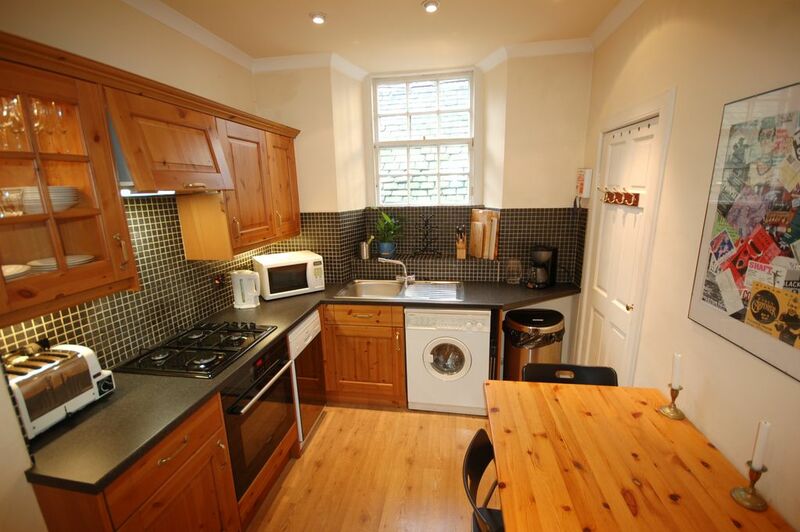 Appartment is very conveniently located near all key sites as well as pubs, restaurants and shops. Clean, comfortable and Francois was very accomodating. Highly recommended. Perfect location and great space. The apartment rental was exactly what I was looking for. The location on Rose St. was ideal. A Dec. rental and close to the Christmas market, the Castle and old town. Francois greeted us at the apartment and recommended restaurants, which were very good. The apartment is not large, but perfect for 2 people. There is a functioning fireplace, clothes washer, and plenty of hot water for the shower. I highly recommend this rental. This flat is in an absolutely spectacular location: step out the front door to the heart of Rose Street. A short walk to the train station, tram and bus lines. A lovely stroll over to the royal mile and castle. Being in the middle of things is fantastic. It does mean a little bit of noise, some odors from the shop below and, at one point some sick on the street just outside the door to the building (we let Francois know and he had it cleaned up within a couple hours). But that's just city living. And so worth it to be in the heart of the heart of the city. The flat is easily accessible just one flight up from the street and nicely laid out. A real highlight is the gas fireplace in the living room. We used it a lot and it made the place so cozy and warm. The flat is located on Rose Street which runs parallel to both Princes Street and George Street making it a superb base from which to explore the city. You are just a 10 minute walk from Waverley Station on Princes Street so it's easy to arrive by train into the city. A host of shops, bars and restaurants are right on your doorstep so much so the only problem you'll have is trying to decide where to go and how to fit it in during your stay.